Oh well – before we left for the canyon we checked the Weather Channel. The temperatures in the Guadalupe Mountains down to Alpine, Texas and Big Bend are going to be in the 30’s for the next 2-4 days. Frank checked the 10-day weather forecast before we left Houston and the temps were supposed to stay relatively mild the whole trip. Based on that information, he didn’t bring his cold weather gear. With this new weather system blowing in, there’s no way he will be able to ride any distance without his leathers. Just for the record, I had my gear. Just saying. We could try to wait out the weather but it could be days and we are scheduled to be home on the 15th so it looks like we are heading home short of our goal. What that means is it looks like the Texas Perimeter Ride is going back on my bucket list. So close. Our route after leaving Palo Duro Canyon was the same but instead of turning west we headed southeast towards Abilene. We spent most of the day riding in strong crosswinds. You know the kind where your bike leans sideways and the skin on your face flaps like the American flag. It was relentless. In the distance the dust was stirring across the plains with little dust devils swirling upward seeking fresh air. The sky off to the right, close to the ground, was a milky brownish orange and then the road curved and we were headed right for it. There’s no stopping now. KEEP CALM AND CARRY ON! Rather than fret over the unpleasant riding situation I decided to embrace the moment. Who knows, it might be the closest I ever get to riding in tornado like conditions. It was a spectacular event. Before it was all said and done, we rode through one short sandblast and two dust storms, both close to zero visibility. After the “tornados” we stopped just west of Abilene for water. I was dusting myself off when a girl walked over and introduced herself. Her name was Melissa. She said she and her husband, Jaime were our traveling buddies. She pointed to her vehicle and I knew exactly what she was talking about. We passed them on the highway – the first time somewhere outside of Amarillo. Before Abilene we passed them two more times. The last time I was going to wave and hold up three fingers but it was right in the mist of all that wind and dust and I was afraid to let go of the handlebars for even a second in fear I’d be another Dorothy without a Toto. Lo and behold, no need. We stopped at the same place down the road. She said she was so glad to see that we made it through the storm. She admitted she had been a bit worried about us. The reason I knew we passed them three times is because this is what they were driving. 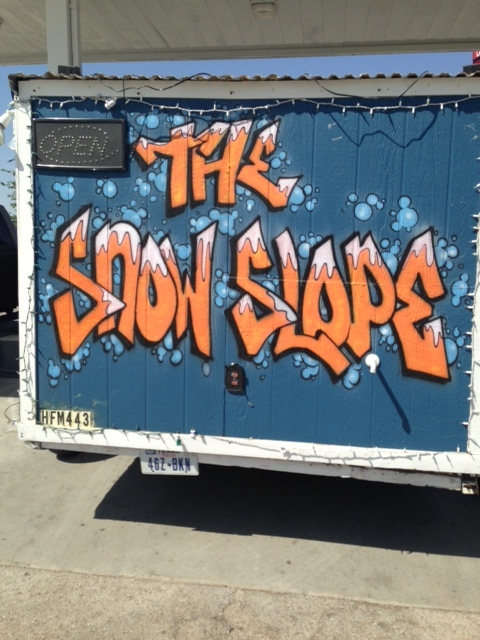 Yes, that’s a snow cone trailer. Pretty impressive, huh! Well, I guess that’s what you would call it. Melissa had a very interesting story. 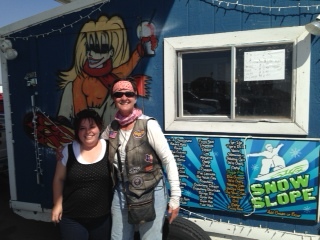 She said she had a thirteen year old daughter who she wanted to spend more time with so she quit her job and went into the snow cone business. She went from corporate to carnival and loved every minute of it. Jaime thought she was crazy at first but when he saw how happy this new business venture made her and his daughter he was down with it. They decided to go big and bought another store. They went to Abilene to look at it and when they saw it had a superhero painted on the side they knew it was the building for them. You see, Jaime is a Superman buff. And there you have it. If you’re ever in Abilene and see the Slow Slope stop in for a Superman cone. It is their signature flavored cone. Here’s a shout out to Melissa and Jaime. Hey guys! It was nice talking with you both. This entry was posted in On The Road Again and tagged motorcycle ride, motorcycle travels, Snow Slope. Bookmark the permalink.